Colombia’s President Ivan Duque made his first visit to a reintegration compound for demobilized guerrillas on Saturday, three days after local community leaders said they received a death threat. 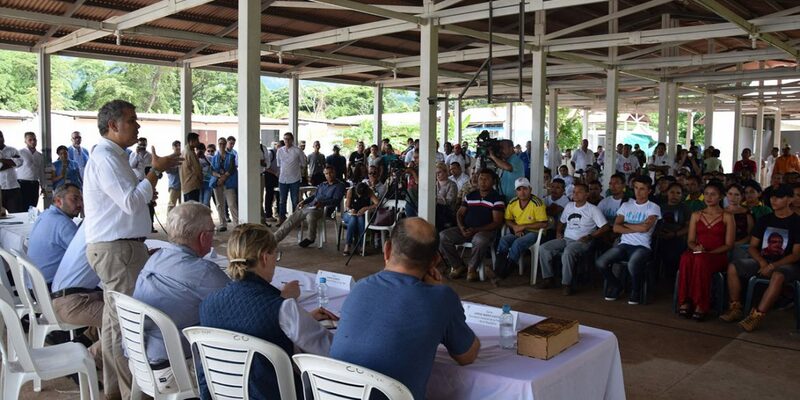 The president, accompanied by UN mission chief Jean Arnault and two top EU officials, Special Representative Eamon Gilmore and ambassador Patricia Lombart, visited the FARC members and community representatives in Fonseca, La Guajira. Duque’s visit was meant to “make the insecurity disappear” among demobilized guerrillas, many of whom have abandoned the peace process amid major delays in their reintegration and the Duque’s repeated vows to unilaterally amend the 2016 peace deal. I want to tell you: we will keep our word with those who are genuinely carrying out their reintegration process with truth and non-repetition. In this land there are no enemies of peace, because we Colombians want to work for peace-building. Two days before the visit of the president and the top officials, indigenous organizations from the region said they received a death threat from the “Aguilas Negras,” an elusive far-right group that has claimed to support Duque and his policies. We have arrived to defend sovereignty from the corrupt calling themselves defenders of Mother Earth or human rights defenders, and who do nothing but undermine the country’s progress. We will cleanse the province of this scum. Death to those bandits. The coinciding visit and death threat appear to confirm UN concerns about the state’s repeated failures to effectively facilitate the FARC’s reintegration and illegal armed groups’ ongoing efforts to undermine the peace process. Arnault told the UN Security Council last week that the “weakness or non-existence of state institutions” as well as the pressure from illegal armed groups pose a threat to the peace process. Colombia’s peace process seeks to end decades of armed conflict and political violence that has killed more than 210,000 civilians, left more than 80,000 missing and displaced more than 7.5 million.